M-Th 7:30 a.m. 5:30 p.m.
Fri 7:30 a.m. 7:30 p.m.
New unit. Fully factory warranty. Cash price. 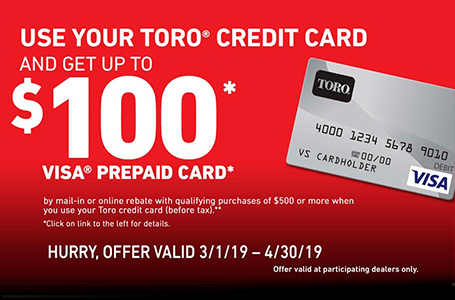 Price includes all Toro incentives. Now you can have your lawn tractor and your zero-turn mower too. 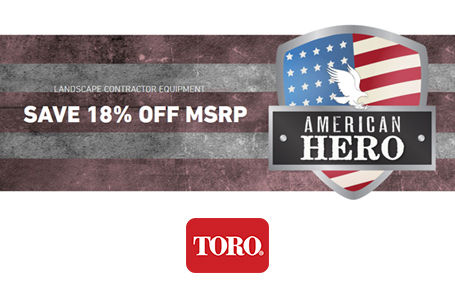 Toro’s innovative TimeCutter® SW lawn tractors are the perfect blend of both. You get the controls and side hill stability of a lawn tractor with the maneuverability and time savings of a zero-turn lawn mower. 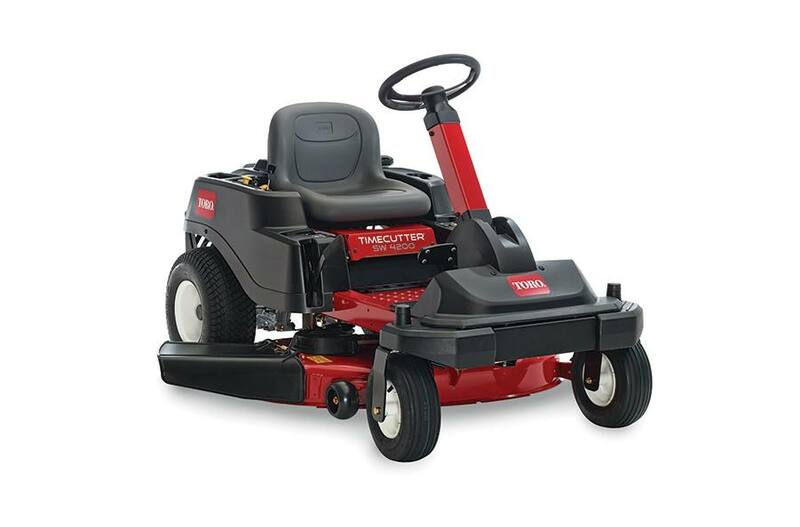 The TimeCutter® SW4200 42 inch 24.5 hp Toro V-Twin 708cc with Self-Cleaning Air Filtration System Zero-Turn Riding Mower has a 2--blade mowing system under a 4 inch deep, top discharge deck design with convenient washout port. The mower boasts 7 cutting positions between 1-1/2 in. and 4-1/2 in. in height. 42" (106.7 cm) Mowing Deck: Toro's four inch (10.2 cm) deep, top discharge deck design provides superior cutting performance in all conditions. Anti-scalp wheels allow the deck to float over the turf and reduce scalping. Create your own natural fertilizer by adding a Recycling Kit® or make yard clean-up a snap with an optional Twin Bagging system. Smart Park™ Braking System: Toro’s unique braking system automatically stops the mower deck and sets the parking brake when you need to get off the mower while keeping the engine running. High Back Seat: When you're mowing for an extended period, there's no substitute for a good seat. The 15" (38.1 cm) high back seat offers premium support during longer mowing sessions. Recycler Kit: Cut more grass in less time and improve the health of your lawn. Toro’s innovative Recycler® mulching system minces grass clippings into fine particles and puts them back into your lawn giving you a healthy, lush looking yard. Twin Bagger: Pick up lawn clippings, leaves, and debris quickly with our Twin Bagger. Our twin baggers have a 6.5 bushel (8 cubic feet) capacity. If you’re purchasing bagger for a lever steer TimeCutter, you’ll also need weight kit (Part #131-7658) and mounting kit (Part #131-3966). If you’re purchasing bagger for a steering wheel TimeCutter SW or TimeCutter SWX, you’ll also need mounting kit (Part #131-3966). The gross horsepower of this engine was laboratory rated at 3,600 rpm by the engine manufacturer in accordance with SAE J1940 or SAE J2723. As configured to meet safety, emission and operating requirements, the actual horsepower on this class of mower will be significantly lower. We reserve the right to improve our products and make changes in the specifications, designs and standard equipment without notice and without incurring obligation. See retailer for warranty details.